Sunday saw the playoff field finally settled as we hit the end of the regular season, and we saw plenty of big performances on the defensive side of the ball. In particular, we saw several defensive player deliver game winning performances, so with that in mind, here are the Sunday Standouts on the defensive side of the ball. The San Francisco 49ers finished the regular season as one of the hottest teams in the NFL, and safety Eric Reid had a big day to help that defeat the Los Angeles Rams. Reid was targeted often in coverage, but of the eight passes where he was the primary defender, he allowed just 21 yards on six receptions. 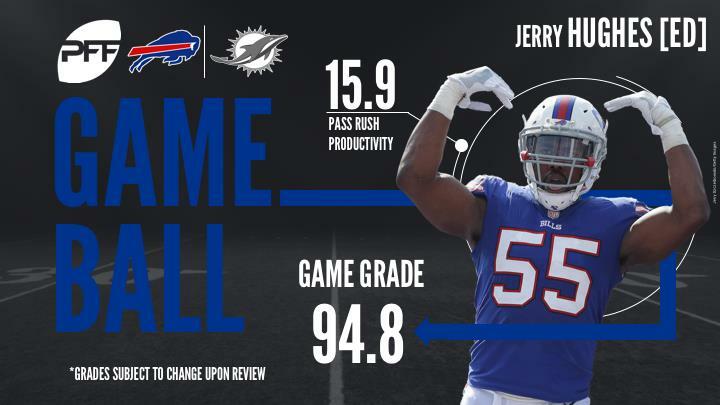 The Buffalo Bills sealed a dramatic return to the postseason on Sunday, and edge defender Jerry Hughes was disruptive as a pass-rusher, despite not registering a sack. From 32 pass-rushing attempts, Hughes racked up seven hurries, good for a 16.4 pass-rushing productivity rating. Ending his season with the best performance of his career, Los Angeles Rams cornerback Kevin Peterson had a huge day in coverage. Targeted five times in coverage, he allowed just one reception for 14 yards, and came away with two interceptions. All that put together resulted in an NFL passer rating of 0.0 on throws into his coverage. The Minnesota Vikings locked up the number two seed in the NFC, and safety Andrew Sendejo was key to that. Of the two passes where he was the primary defender in coverage, he allowed just one reception for five yards, and came away with a pass breakup. Despite being targeted six times in coverage, Bills cornerback E.J. Gaines had an impressive day in coverage. Allowing just four receptions for 16 yards, on 48 snaps in coverage, he finished the day having allowed just 0.33 yards per coverage snap. 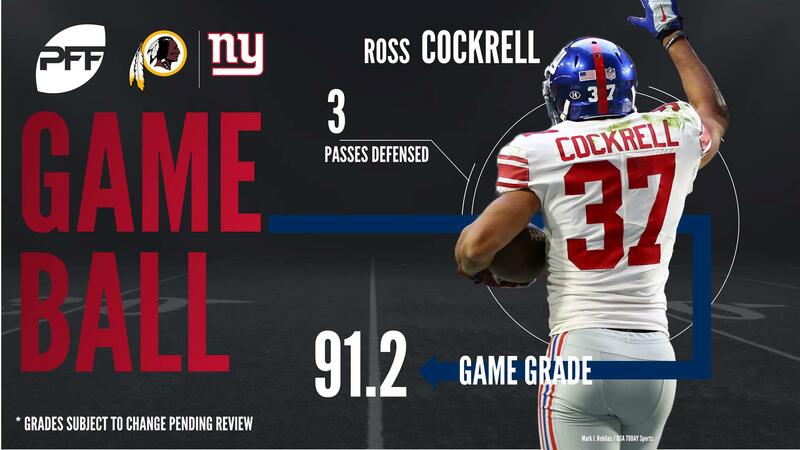 New York Giants cornerback Ross Cockrell has had a strong end to the season, and he put an exclamation point on the year with a big performance on Sunday. Targeted nine times in coverage, he allowed just three receptions for 35 yards, resulting in an NFL passer rating allowed of just 6.5. Wins by the Buffalo Bills and Tennessee Titans kept the Los Angeles Chargers out of the playoffs, but Melvin Ingram ended the season with another impressive performance. From 27 pass-rushing snaps he racked up a sack and two hurries, good for a pass-rushing productivity rating of just 6.5, but there were another four plays where he had beaten the blocker in front of him, but the ball was away too quickly to result in pressure. After returning to the Seattle Seahawks during the 2017 season, cornerback Byron Maxwell put forward an impressive performance to end the year. While he didn’t record an interception, he allowed just one reception for 11 yards from the seven passes thrown into his coverage, resulting in an NFL passer rating allowed of 39.6. 49ers cornerback K’Waun Williams completed the type of game that few players manage to achieve on Sunday, allowing negative yards in coverage. Targeted five times on 34 snaps in coverage, Williams allowed two receptions, but they totalled -1 yards. Finishing his rookie year on a high, Green Bay Packers safety Josh Jones produced arguably his best game of the year. In primary coverage for just two targets, he didn’t give up a single reception, and came away with a pass breakup.